On April 17th a fire ravaged the large auditorium at the Wilmginton Friends School in Alapocas, just outside the city of Wilmington, DE. Here is a link to a NBC Philadelphia news story: Click Here. 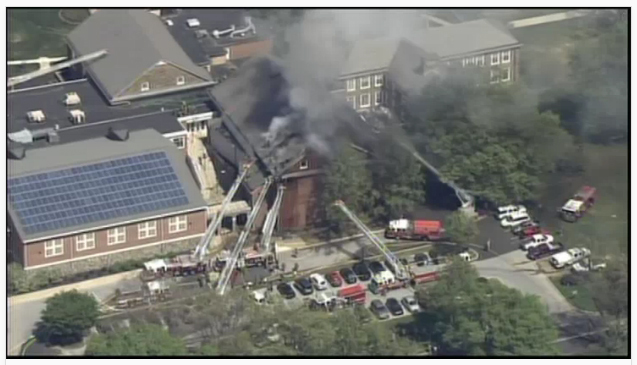 And the local news story with video, describing the fire: Click Here. The school is one of the oldest (Est. 1748) and most prestigious private schools in the country. And even though there was significant damage to the auditorium the school would have to remain open while crews repaired the structure. Ray Carbone, Director of Facilities, called Pinnacle Scaffold to rush in and provide emergency overhead and debris protection for pedestrians and students so that work could begin and the school could remain open. Pinnacle was on the job immediately, and worked around the clock to install the necessary scaffolding, overhead protection, and a work platform for the workers to be able to access the burned areas. The school closed for two days while crews started their repairs but then opened again the following week. We will post photos soon.